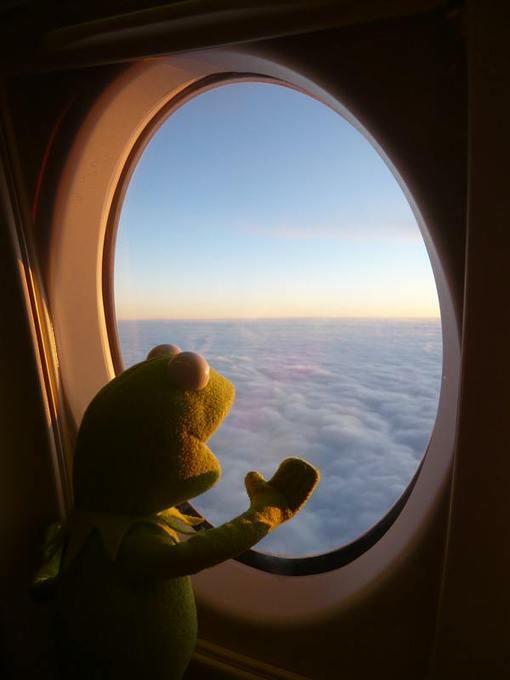 Kermit the Frog also likes to look out the window when he flies. Here I think he's looking for Sesame Street. When I flew down to Maryland to celebrate my uncle’s funeral Mass two weeks ago, I had a window seat on the airplane. And so, once we were in the air for a few minutes, I did what I normally do after a few minutes in the window seat: I looked out and tried to figure out where we were (what we were flying over)—and especially where Westerly was. (I wanted to give you all a little wave.) Now sometimes I can do that: sometimes I’m able to pick out certain landmarks from the air and tell you exactly what city or town is down below. I’m able to do that mostly when I’m flying south and we pass over Westerly early in the flight. But I find that almost impossible to do when I’m flying into Providence. That’s because the world looks so different from “up there”! Things that we see “down here” every day take on a different look when our perspective changes from “the horizontal” to “the vertical”. In other words, God’s perspective on the world, from his vantage point heaven, is a lot different from our perspective on the world from our vantage point here on earth! · God sees the whole picture; we don’t. · God sees how everything in this life—including our sin and our suffering—can work for our good, if we allow it to. We don’t see that, most of the time. · God sees the reality—and the horror—of sin. We don’t always—which is why we sin. The challenge of this life (or at least one of the challenges of this life) is to try to see reality from God’s perspective—to the extent that we can on this side of the grave. One way to test whether or not you are developing a divine perspective on things is to ask yourself this question: In today’s gospel reading, who were the blessed ones? Who were the real winners in this parable that Jesus tells? Was it the workers who got the reward for doing next to nothing? Was it the workers who came in the final hour of the day and did the least amount of work? No! Someone with a divine perspective would say that the truly blessed ones here were the ones who worked the longest, the ones who worked the entire day from dawn to dusk. He’d say that because those who worked all day fulfilled their purpose better and more completely than the others did! Notice that all the men who were hired that day were “laborers”. That was their call; that was their purpose: to work in the landowner’s vineyard and bring him good fruit. The ones who started at dawn did that for the longest period of time—and brought in a lot of great fruit; those who came on board at the very end spent most of their day bored and wasting time and consequently brought in very little good fruit. Obviously, of course, this parable is a metaphor for life, reminding us that even those who convert on their deathbeds can be saved. When they say that, they’re right. For all those previous years they failed to achieve their true purpose: to know, to love and to serve the Lord. And even though they will go to heaven at the end of it all, the fact that they waited until the 11th hour will probably effect the depth of the beatitude that they will experience there. Remember, Jesus does distinguish between “the least” and “the greatest” in his Father’s eternal kingdom. Coming to see reality from God’s perspective—that is to say, understanding the Lord’s ways and thoughts—is an ongoing process. No one—including St. Paul—has understood the Lord’s ways and thoughts completely during their time on this earth. That’s because as human beings we are finite and sinful creatures, while God is infinite and sinless. · Why did God allow those two recent hurricanes to do so much damage to the property of so many people in so many different places? · Why did God allow that school in Mexico to collapse and kill 19 children during earthquake last week? 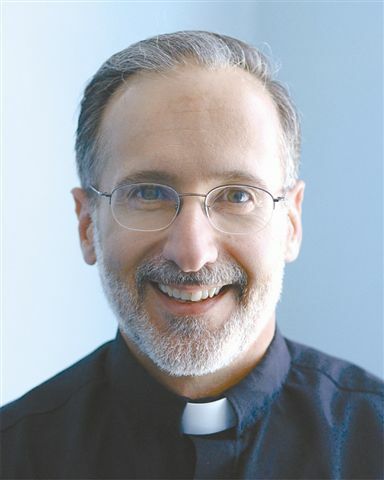 · Why does God allow the killing of the innocent to continue in our world through abortion and euthanasia and genocide? It’s easy to trust God when you understand the “why” of something; it’s much harder to trust God when you don’t understand the “why”. Today we should pray for the grace to do both. I want to close today with a meditation that I’m sure many of you have heard before. But it bears repeating here, because it reminds us that God is always at work—even in the chaos and confusion of our lives. The meditation compares the events of this life to the threads of a weaving. As most of you know, if you look at a weaving from the underside, it looks messy: there’s no pattern to it; threads are hanging from it; it’s not attractive at all. It’s only when you look at the weaving from the other side (the upper side) that you see how all those different threads have blended together to form a beautiful work of art. On Monday, August 21—the day after my retirement Mass and party—I went down to Maryland to see my aunt and uncle (as I’ve done for many years now during the third week of August). This year, though, something was different: my uncle was in a nursing home recovering from a stroke he had suffered a few weeks before. On Thursday the 24th they brought him home and placed him in hospice care. It was difficult to see my uncle in that condition, even though he’s 87 and his health has been declining for quite some time. He’s a retired Army Colonel and has always had a very commanding, engaging presence. People have always loved to be around him. But the stroke, combined with the dementia he was suffering from previously, has taken its toll—making it very difficult to communicate with him in any kind of meaningful way. In fact, with the exception of my aunt, he doesn’t always know who people are—even people in his own family. I’m sure many of you can relate. But, through it all, my aunt has been amazing. In fact, she’s the reason I’m mentioning this in my homily this morning. 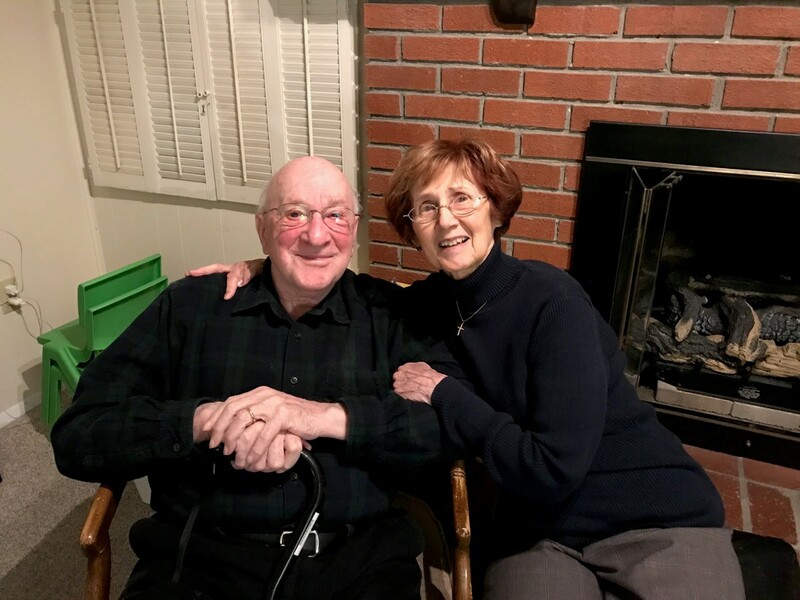 Even though she’s 85 and not in great health herself, she was at that nursing home at least twice a day at her husband’s side—encouraging him and trying to communicate with him—in spite of the fact that he was often saying things that only he could understand. And then, when they brought him home and my uncle got restless and disoriented at 2 or 3 a.m., she got up and went into the separate room (where they had placed the hospital bed) in order to comfort him and calm him down as only she could. She did that every night that I was there—depriving herself of the sleep that she certainly needed. When we first hear a Scripture passage like that, we may think of the great saints and martyrs of the Church, who literally offered their bodies to the Lord in some special service or in martyrdom. And it certainly does apply to them! But the text also applies to people like my aunt. It applies, in other words, to people who make the sacrifices necessary to fulfill their vocations in life well (whether it be as a priest, or a religious, or a husband, or a wife, or a father, or a mother, or as a single person living for Christ in the world). That should be our daily intention as disciples of Jesus Christ. But if we’re going to do this, it means that we will have to think differently than most other people do! Let’s face it, most people in the modern world don’t see their daily, ordinary, mundane tasks in such spiritual terms. They’re just things that need to be done—period. There is nothing spiritual about them. My aunt saw things differently. Because she’s allowed her mind to be renewed by the truth of the gospel concerning marriage, she didn’t conform her behavior to the wisdom of “this age”; rather, she discerned that God’s will for her was that she go and visit my uncle every day—whether he remembered who she was or not. If we want to do God’s will in our lives we have to allow the Lord to do this for us. We have to allow the Lord to work on our minds and give us a different perspective on reality—different, at least, from the typical, worldly perspective that most people have. Now we do that—we allow God to renew our minds—in 3 ways (I got these from Fr. Francis Martin): by thinking about holy things, by praying about holy things (the Bible can help us to do that) and by talking about holy things. How often do you do you engage in those 3 activities? If you’re like me, not often enough. In this regard, the fact of the matter is we are all “works in progress.” That is to say, none of us has a perfectly renewed mind at this moment. And we never will on this side of the grave. Peter’s mind was renewed to the point where he saw Jesus differently than other people saw him—including, perhaps, some of his fellow apostles. Most other people looked at Jesus and saw a really smart and powerful rabbi. But that was all they saw! Peter looked at Jesus and he saw something more! He saw the deeper reality. He saw the man that Israel had been waiting for for centuries—a man who had a unique and special relationship with God. Thanks be to God, Peter eventually got it right. It took him a while—and a few other falls—but he finally had his mind renewed on this point. Which was one of the major reasons why he eventually offered his body in the ultimate sacrifice of martyrdom. He was martyred in Rome by the Emperor Nero in what is now St. Peter’s Square. We will probably not be asked to make that kind of sacrifice ourselves, but all of us will be called to make sacrifices like the one my aunt has made in her life. We will be called to “offer our bodies to God” by doing hard things, difficult things, unpleasant things—in order to love others and to live our vocations well. May we be as successful in our self-offering efforts as my aunt has been in hers.